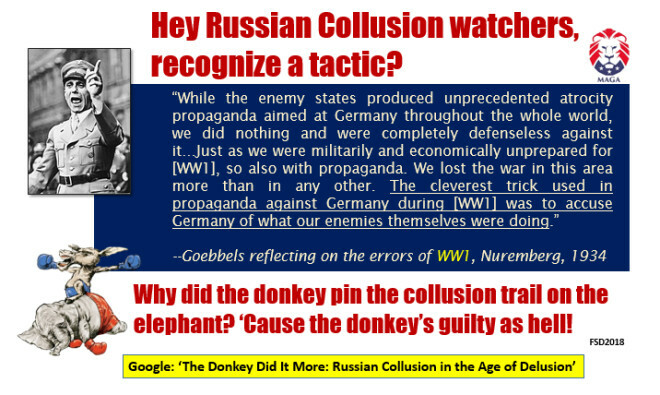 A full year ago, as it was dawning on most reasonable people the Trump-Russian Collusion narrative was a hoax drenched in donkey-fied Goebbelian misdirection, I noted with alarm (here on The Saker Blog) how Never Trumpism, in its manic excesses, was retracing a very dark chapter of Nazi racialist ideology. In a disturbing instance of enantiadromia, this very same faction was accusing half the nation (not themselves of course —the Other shadow-half) of harboring neo-Nazi fixations of their own towards Donald Trump. Millions of Americans’ watched their populist effusions get transmuted by the opposition into a Wolf Blitzkrieg-narrated version of Triumph of the Will. Of course much can be said about Trump’s subsequent drift into the same old Neocon orbit. But without doubt, the early hostile reception attending his Russian overtures did little to encourage a pivot towards improved relations between the two countries. Still, one cannot help but wonder how things might have turned out absent sui generis ethno-racial antagonisms. The original McCarthyism was salutary for destroying lives solely on the basis of ideology. In the present climate, decent men and women rise in salute of Tail-Gunner Joe’s scrupulous avoidance of DNA samples. “The term Russian collusion sounds like it walked off a Tavistock Institute clipboard with the usual aim of promoting fear and avoiding mass enlightenment. Knowledge is power. Enlightenment is the coveted reserve of the Few. Not surprisingly, power favors misdirection (ignorance) over enlightenment (empowerment). Dumb down and frighten — divide and conquer. This is why the plebeian class is often referred to as the disorganized masses. Buffeted by successive waves of misdirection, society becomes a de-articulated echo chamber of movements, ideologies and belief systems. Horizontalized incoherence averts vertical assaults on those who preside on high. The Internet alt-narrative, a bottoms-up constellation of knowledge simultaneously disseminated and protected by its distributive architecture, is climbing the enlightenment ladder slowly. It needs to hurry. We find an early Russophobic send-up in the zany 1966 movie The Russians Are Coming! 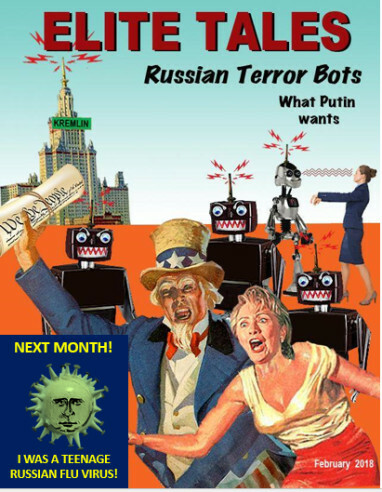 The Russians Are Coming! Trying desperately to stay under the radar of state actors (with their penchant for international incidents and Independent Counsels) a Soviet sub and its crew, having run aground on a Cape Cod sandbar, enlist the support of sympathetic Cape Cod villagers to regain open waters. Their Russian nationality is initially hidden (isn’t it always?) behind the guise of Norwegian fishermen. Everyone has the presence of mind not to call CNN. The movie instructs that, when encountered in everyday interactions, Russians are people too. Imagine that! This humanizing touch was a real coup in Cold War America. The visceral and reflexive fear of a prior era is being resurrected. But as prelude to what? More on that later. Russian collusion is also calculated to stoke primate fears. In essence, the colluders have acquired an infection from the main doctrinal source; Russia being a sort of Typhoid Mary. The resultant false doctrine (revived nationalism, multilateralism, Eurasianism, post-Bolshevism, Christian renewal) has the potential to visit a cognitive plague on the larger group, or should we rather say their doctrine poses a health threat to the prevailing narrative, the latter being an illness in itself that seeks the preservation of the Few at the cost of the Many. So, a pervading illness erects the strawman of a secondary ailment in order to defend the primacy of its own pathology. Never mind that, for Americans, this secondary ailment is exactly what the doctor ordered. The truth is disguised as a disease. The emanation point is Russia. Keeping the masses both joined to a common moral cause (the Straussian baton of Greatest Present Evil has clearly passed from Terror to Russia) and trained on their potent enemy (for what appears to be an imminent conflict), our Managers find the prospect of We the People—in our militarized permutation—inflicting a deathblow on Russia, while getting annihilated ourselves, a very tempting two-for-one proposition. For the moment, until a cure is found (or a war is started in earnest) we are urged to please wash our hands thoroughly after handling all things Russian. Russian flags on Olympic grounds could spark an outbreak. Ban them. If you encountered a Russian-sponsored ad on Facebook during the election be aware the contagion may have survived on your PC screen for weeks, causing some to waste their vote even on the likes of Jill Stein. Now that’s sick! The political valence of the click ads–Trump or Clinton—didn’t matter either. Germs are agnostic and airborne. They can travel for miles disguised as competing worldviews. Sometimes the drumbeat can carry us into the most surreal byways. Take the positively eerie instance of a CNN correspondent venturing onto an elderly pro-Trump Floridian’s front lawn to question her patriotism and Russian sympathies.Throwing caution to the wind, he fails to don the official CNN gloves and surgical mask. What is he in this instance: a journalist, a stalker, an ideological ambulance-chaser, a proto-Soviet Precinct Captain? More linguistic mischief. We encounter the nefarious The dozens of times a week as in The Russians. Deployment of the definite article as preface to an ethnic group, people or tribe is another tactic aimed at suggesting members of a particular group can no longer be referenced as autonomous individuals, having become hive-minded Stepford Wives lashed to an agenda injurious to the larger group. The The’s are behind the recent ramp-up of crime! No sooner do the The’s move into the neighborhood than property values take a dive. The The’s control the world! The perils of ethnic scapegoating are a matter of historical inspection. Why then are they being so systematically courted? The indignation of our nation’s 2.9 million Russian-Americans is entirely too muted, certainly under-televised. Perhaps Wolf Blitzkrieg can look into this. 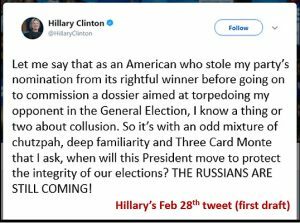 In a recent tweet, Hillary Clinton stoops yet again to Russia-baiting. Then there’s the thirteen Facebook trolls who happen to be Russian nationals engaged in a strictly business venture with no evidence of a state actor role and no overt political leanings. None of this prevents Deputy Attorney General Rod Rosenstein from alluding by sly inference to the Russians during his press conference (here at 3:19) as though King Bee Putin himself was supplying the company with kitty and puppy clickbait pics from the depths of the Kremlin’s basement. Today, as the Trump-Russia Collusion hoax collapses in an exhausted heap, hopelessly discredited by the anticipated broadly bipartisan Senate Intelligence Committee report as well as the recent (and quite riveting) ABC News interview of former Trump (and long-time DOJ) attorney John Dowd, we can only look back in horror and beg the forgiveness of our Russian-American friends who, it seems even now, continue to weather an Anti-Slavism onslaught surpassed only in intensity by Nazi Germany itself. 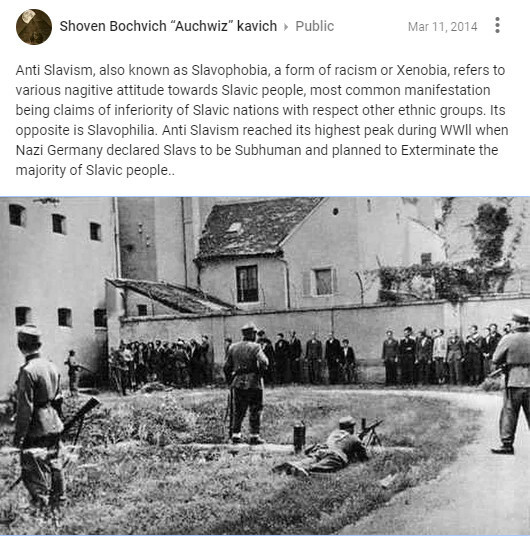 So, what exactly is Anti-Slavism or Slavophobia? The insert below offers both definition and harrowing genealogy. Did media luminaries travel the globe systematically exploring and discarding potential instances of, say, Finnish and Indonesian collusion before stumbling across—and belaboring mightily—the Russian brand? Nyet. It was Russia Russia Russia from the get-go. 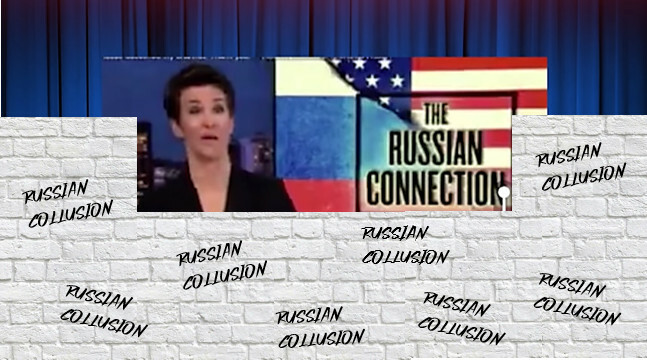 It’s high time Neo-Nazi revivalists such as Maddow either provide evidence of Slavic genome deficiencies and incontrovertible Untermenschen status or cease, desist and apologize profusely to this large and significant segment of American society. If such evidence does exist, then all that remains is to determine as a society how this beleaguered genome in our midst can best be addressed from a public policy standpoint. Better to ask Maddow, but ideas include sequestering all Russians in Idaho, affording them spotty civil liberty protections or pursuing barbed-wire internment (ala Americans of Japanese descent in WW2), etc. From a purely American standpoint, the opportunity cost implicit in this unwarranted (and perilous) derailment of a Trump-telegraphed US-Russian rapprochement has been nothing short of ruinous for a reprised Kissinger-esque triangulation strategy, while wildly beneficial to accelerated Eurasian integration. The double-helix China-Russia alliance (postulated in 2014 by Saker blog frequenter Larchmonter445) has been allowed two further years of unanswered fermentation, increasing the likelihood the US will face a two-front world war —something the Pentagon itself has recently conceded. Thus, what may have started as a Hillary-Clinton-in-defeat face-saving campaign (if not an outright Obama-initiated GCHQ/Five Eyes coup) could well reap the bitterest fruit of all: a world-ending conflagration. It’s enough to want Heil Hillster back.